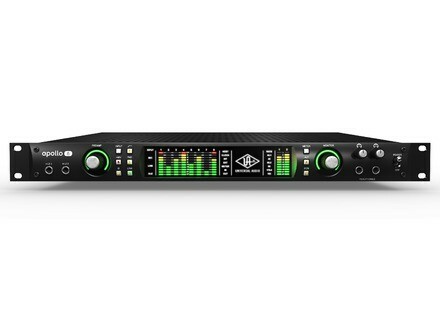 Apollo 8 Duo, Thunderbolt audio interface from Universal Audio in the Apollo series. I bought this interface 3 months ago after I had the opportunity to try many different audio interface models in several stores (mainly in Europe). As the shope rarely had high-end monitors available, I compared all interfaces using mid-range, 2-way monitors. Caution : I did not try the Appolo 8 but the previous model, since the Appolo 8 was only released later in May 2015. Every try I gave it, the Appolo 8 provided superior sound quality and dynamics compared with other models. That’s how I initially made up my mind towards buying an “old” Appolo. I then heard it through Eve Audio sc 408 monitors, and it sounded just sublime – clear, clean, noiseless, in a word: great. On the day I was set to buy it, I’m mentioned the availability of the new Appolo 8. So, I decided to buy it based on sound amelioration, added functionalities, the unison system available on several inputs and the better software. I did not have an opportunity to compare both (old and new) models side by side. The sound the Appolo 8 delivers is breathtaking, I believe it to be even clearer than earlier models but the difference seems rather small. The interface is well-built, sturdy – very sturdy – , the controls are pleasant to use and the functionalities easy to read on the front. It features an external power supply, which is a large block to be hidden under the table. The possibility to use two different headphones for monitoring at the same time is a very good point. Almost all functions can be set up directly from the software, which is awesome. The unison feature is also very useful, no mic or instrument is perfect and corrections can be applied using this feature which is available on all inputs. It doesn’t look like much but it’s possible from the input to set everything up so as to get a clean recording with a good basis, hence one that will need less tweaking later on. Latency is minimal, impossible to perceive to me at least. Noise level is also extremely low, much lower than any other interface. It’s very important when recording solo instruments or classical music that features important volume variations. Another huge asset is the possibility to use high-quality plug-ins within the interface. Unfortunately they’re not free or cheap, but it just takes watching for special offers to get important discounts. Considering the general price of interfaces and that of this model in particular, the price is not excessive. Don’t forget the (very useful) additional features that come with it such as the unison functionality and the possibility to work directly with plug-ins, which relieves your CPU.